Is that a cat? A dog? A raccoon? No. No. And not quite. Meet Tanuki—a mischievous darling of Japanese folklore and the star of our new PICA print. Being still quite an unknown character in the West, Tanuki is often misunderstood and misrepresented as the urban trash-diving scavenger, the raccoon. Raccoon dog. Photo by Cloudtail the Snow Leopard. Tanuki (狸 or たぬき) is in fact a raccoon dog. Despite its name, the animal, other than some facial spotting, has nothing in common with the raccoon or a badger (another popular mistranslation). Raccoon dog falls under the Canidae family of dogs, wolves, foxes, and coyotes. One big giveaway is the lack of the notorious black tail rings. Originally native to the far East, the species have travelled across Russia, and can now be spotted in some parts of Europe. Fun fact: unlike their canine cousins, raccoon dogs spend their winters in hibernation—snuggly cuddled up to their partners until the coming of the warmer days. But enough about its National Geographic description. In Japan, when someone mentions Tanuki, it is not the actual raccoon dog that one conjures up in their mind. Tanuki also happens to be an adorable magical prankster that falls under a class of spirit monsters called yokai (妖怪, youkai, ghost, demon, or monster) in Japanese folklore. Referred to as bake-danuki (化け狸, supernatural tanuki), he is more of a mischievous jovial character in comparison to the more traditionally malevenous monsters of the yokai family. He can be at times frightening, but for the most part he is often portrayed as also having a good side to him, bringing good fortune and prosperity to those who form a relationship with him. He is fluffy, skillful at deception, carrying giant testicles that allow him to achieve extraordinary feats, but more on that later. Tanuki is famous for his shape-shifting, illusion-casting abilities. It is said that Tanuki often disguises himself as a human in a form of a beautiful woman or at times a Buddhist monk, with the one purpose to misguide and trick the unsuspecting folk. These transformations are believed to be possible with a placement of a leaf on his head. It is also possible to catch Tanuki in disguise as he is believed to become luminous when transformed and can accidentally show his tail if he loses focus. Another tell is that in rainy weather the clothes of his illusion would remain dry. In folklore Tanuki is often discovered well after the fact, when he falls asleep and transforms back into his animal form. 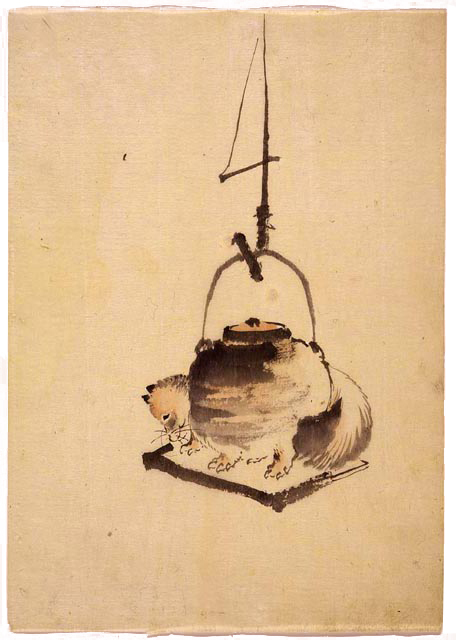 Tanuki Tea Kettle by Katsushika Hokusai. Tanuki, a skillful shapeshifter, can disguise himself into just about anything in hopes of tricking yet another victim. There are a number of tales that talk about Tanuki shape-shifting into objects for monetary gain or just plain trickery. Tanuki is a master of illusion. He can make leaves appear as money, only to be discovered after he is long gone, as well as create illusions of unfamiliar surroundings to confuse travelling folk causing them to get lost. Tanuki also loves good ol’ pranks that don’t involve any supernatural abilities. Some of them are drumming on his belly to draw people away from their path in the woods, or making sounds to make people think they are hearing thunder and lightning to create confusion—all in the name of mischievous fun. Tanuki at Ensen-ji (円泉寺), Buddhist temple in Tokyo. Tanuki statue. Photo by Alexis. Tanuki is a popular cultural icon in traditional and modern creative works in Japan. He has been the main subject of many literary works, legends, and traditional Japanese works of art. 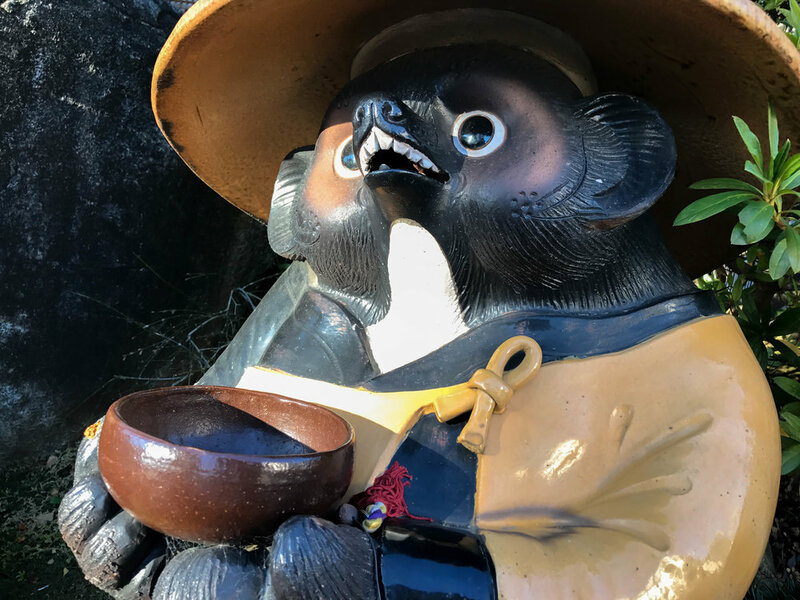 Today you may notice a ceramic statue of Tanuki placed outside business establishments in Japan akin to maneki-neko, the lucky beckoning cat, drawing visitors to come in and spend their money. 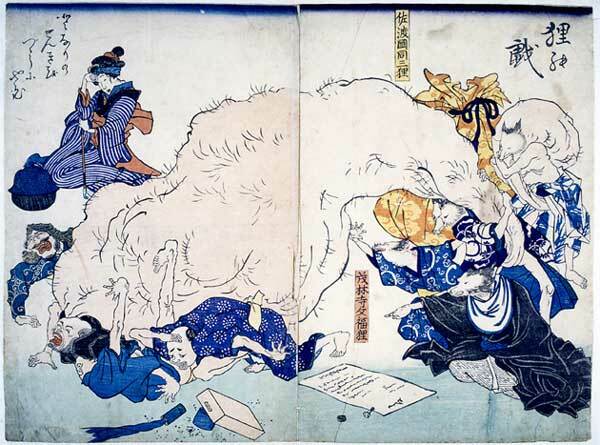 Frequently he is depicted, in a modern 20th-century take by Fujiwara Tetsuzo (藤原銕造), as a plump round-bellied animal with big eyes wearing a straw hat with a bottle of sake and a promissory note of unpaid bills (though these items can vary), sporting an engorged scrotum—most featured aspect in the traditional Tanuki artistic depictions. So among the many magical abilities of Tanuki, the most memorable one must be the expanding scrotum. It is said that Tanuki can stretch his scrotum to the size of eight tatami mats—often pictured stretching for various creative feats and tasks, and never in terms of any sexual connotation. The concept is thought to have come from Kanazawa’s metal workers, who in the olden days would use the skin of tanuki testicles to wrap gold as an aid in creating the thinnest sheet of gold possible. One needed to use the skin that could stretch, and tanuki’s scrotum skin could stretch up to the size of eight tatami mats (approx. 13 square meters). Later people would make wallets and lucky charms out of the skin as it was believed it could stretch ones money as it did it with gold. Another reason Tanuki gained fame with his scrotum is due to the connotation that came from phonetically similar terminology of ‘kin no tama’ (金の玉, balls of gold) and kintama (金玉) for testicles, popularly associated with prosperity and good fortune. Our Tanuki print might not have visually depicted the money beckoning feature, but you can’t say it’s not there somewhere. Still, it is a G-rated symbol of fortune nonetheless. Or a symbol of staying young, playful and wild as we also like to think. And much like the raccoon dog waking up with the coming of spring, today we are introducing our Tanuki print as the new addition to our family of colourful wall art illustrations. It’s a new season outside, so why not go ahead and brighten up your walls with some much needed colourful whimsical folklore magic. Shop here for the various colour combinations to suit your magical space. 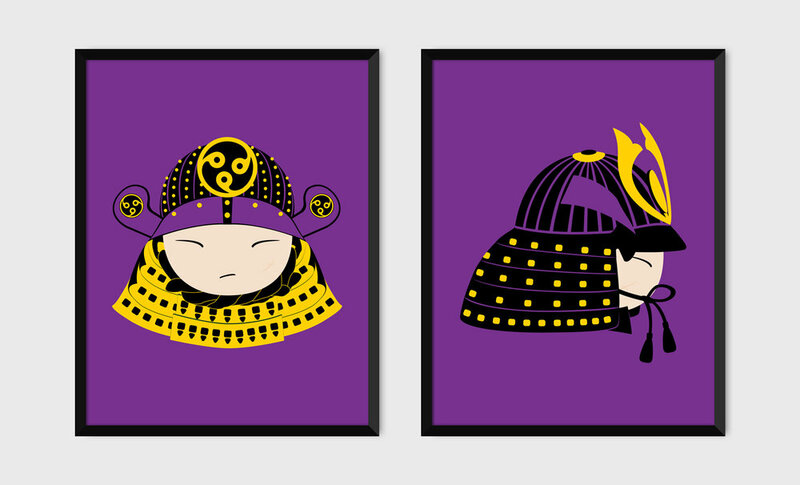 Today we are revealing our new colourful pair print edition featuring our cute but fearsome samurai warriors in brand new PICA pop art colour scheme. Samurai is perhaps one of the most widely known Japanese cultural icons that has encompassed history spanning the greater portion of the last millenium. The warrior class—easily recognised by their ornate armour that has inspired many creative works of our modern pop culture, including the notorious Darth Vader gear ensemble—has long been the object of fear for their outwardly look and reverence for their historically renowned code of ethics known as Bushido (武士道, bushidou). Our samurai prints featuring the kabuto (兜) helmet, the iconic part of the peculiar yet very versatile and practical samurai armour, boast the severity and genius behind the design meets function at its core. The entire attire was designed to allow its wearer a full range of mobility while protecting and shielding the body from enemy impact at all angles. The samurai gear has long since then become an inspiration to our modern battlefield wear, where the samurai code of ethics has left a much bigger cultural mark on our understanding of the true meaning behind the word ‘chivalry’. But first, what is a samurai? Samurai (侍), also known as 武士 (bushi, warrior; samurai), were the warrior class of the feudal Japan. Beginning in history as provincial warriors and rising to power in the 12th century as Japan’s first military dictatorship, the shogunate (将軍職, shougun-shoku), samurai dominance continued all throughout the history until the Meiji Restoration (明治維新, meiji ishin) of 1868 due to the abolition of the feudal system. The samurai character 侍 in Japanese, meaning ‘to serve’ or ‘the one who serves’, referred to the Imperial Court guards at that time that were of noble birth and comprised the highest ranking social caste. They were a military class of well trained and well learned warriors, who believed in chivalry and lived by the guide of the unspoken code of ethics or moral principles, known as Bushido (武士道, bushidou): “the way of the warrior” or “precepts of knighthood”. At its source were the teachings and practices of Buddhism and Shintoism as well as the ethical doctrines of Confucius and Mencius. Loyalty to the sovereign, respect, self-discipline, ethics, and trust in fate are just a handful of dominant traits adhered to by the samurai warriors of the time. The Bushido code set a moral standard for the rest of the living in the feudal Japan era, guiding them by virtue of example of the samurai. This makes Bushido the core source of the moral code in a premodern Japan. So let’s look at the moral teachings of the samurai ethics code to live by today. The Bushido code is believed to be comprised of the eight virtues that had long become the core of ethics and chivalry in the premodern Japan. Not all samurai of course would live up to follow them, but the true esteemed warrior that was celebrated and revered with utmost respect by the society of that time would become the epitome of what chivalry means to us today. 義 (gi) or righteousness is perhaps the strongest virtue of the Bushido code. It is the power of being able to resolve to the true course of action based on one’s reason without wavering. It is to understand that the resolved action should only be made with true purpose and at the right time. “To die when to die is right, to strike when to strike is right.” Rectitude is the foundation or the skeleton of the Bushido structure. Without rectitude the status in becoming of true samurai character can never be obtained, regardless of how much learning or talent one was able to acquire in the process. 勇 (yuu) or heroic courage is not simply being fearless, but being fearless in doing what is right. Doing what is right in itself is to have courage. A truly brave man is calm in the midst of calamity. He is never taken by surprise. He is able to distinguish the true course of action through his sound reasoning and true righteousness without hesitation, regardless of the consequences. 仁 (jin) or benevolence, compassion is one of the Bushido virtues taking its roots from the Confucian teachings. A warrior possessing the power to command or to kill should also exhibit an immense ability for compassion. To be benevolent is to be mindful of others’ suffering, and to show mercy where mercy is needed. It is to bear sympathy, magnanimity, and love for the living; making benevolence the highest attribute of the human soul. 礼 (rei) or politeness, respect, etiquette is at the core of the social ethics in premodern Japan, also known as courtesy that is prevalent in its society to this day. Politeness through Bushido, though, is not just an empty shell of actions that are meant to make one seem respectful or courteous. Rooted in benevolence, it should only come of the regard for the feelings of others. Thus, in Bushido politeness in itself is nurtured in compassion and is a graceful expression of sympathy. 誠 (makoto) or sincerity, honesty, integrity, without which politeness, the fourth virtue, would only be an empty shell of socially acceptable actions. The word of the samurai—武士の一言 (bushi no ichi-gon)—had so much weight at that time that it was deemed beneath one’s dignity for it to be voweded upon or put down in writing. The true samurai of the Bushido ways failing to follow up on their word would view it as derogatory to their honour. Lying in itself was not regarded as a sin, but instead as a weakness, and thus highly dishonourable. Bushido ethics of honesty and sincerity, however, had failed in attempts to be applied in business matters. Wealth itself could not be associated in the ways of honour. Subsequently money was seen as an object of menace to manhood, and even children of high-ranking samurai were raised to show ignorance of the value of coin. Money was thus to be ignored, making the warrior free of the evils where money was root. Kabuki actors dressed like samurai. Hand-coloured photograph around 1880. 名誉 (meiyo) or honour was in a way a cornerstone of the warrior’s reputation. It was believed that a true samurai would strive to attain a good name for himself by closely following the Bushido ways of the warrior. Life itself was considered worthless if honour and good name were not bestowed upon the samurai in its course. The fear of disgrace kept the samurai in check. Often the only way one could regain one’s lost honour is by the means of self-destruction that had to be carried out with utmost composure and coolness of temper. 忠義 (chuugi) or loyalty, instilled by the Shinto doctrines, governed the principle function of the samurai; that is namely their duty to the sovereign. The duty of the samurai was to serve the Imperial Court, and put their loyalty towards their master even above that of their family. The duty of loyalty, however, is only a virtue in correlation with honour, the sixth precept. As a samurai, one just does not blindly follow one’s master. If the path before the warrior is righteously wrong, true samurai is willing to convince his master in his wrongdoing, even at the cost of his own life. 克己 (kokki) or self-control would become the main building block in the character-building of the samurai. Bushido instills the moral teachings of ethics and chivalry as the core of the samurai behavior. With having the ability to yield power and pass judgement, one must also have had to learn to keep oneself in check. A true samurai would never show his emotions on his face. The most natural affections were kept under control. Thus, for the samurai to have self-control is to be level-headed at all times, never having one’s emotion affect his judgement. These are the eight virtues of the samurai as originally interpreted in the book entitled Bushido: The Soul of Japan by Nitobe Inazo, first published at the dawn of the 20th century. Aside from the eight virtues as inscribed above, others less dominant yet equally influential were wisdom (智, chi), filial piety (孝, kou), and fraternity (悌, tei). Wisdom in particular was important as it was believed that a true warrior had to be well-versed in teachings of diverse facets of moral knowledge. Bushido was a creation of the premodern Japan. But is it still present in the context of its modern society? Some might say that some of the values have long been forgotten and moved aside for the modernization of Japan towards industrialization and capitalism. Despite all that perhaps all of us can find something endearing within these virtues, and perhaps reintroduce them into our own moral code of ethics. 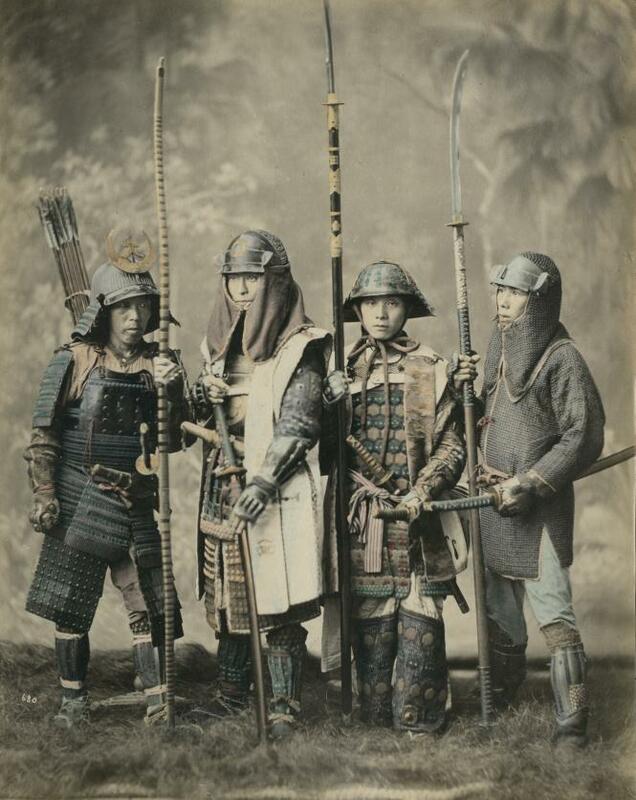 Samurai were the epitome of chivalry in Japan at that time. Maybe it is time to bring the way of the samurai back, as I think we could all agree that we all could use a little bit more chivalry in our daily lives today. Kingyo, Our Newest Summer Collection Print! This year to commemorate the summer coming to an end we are pleased to announce that we have a new addition to our summer-themed print collection. This aquatic blue baby is our nod to one of the most easily recognisable summer symbols in Japan—Kingyo (金魚). Kingyo is Japanese for goldfish, with the kanji characters 金 (kin) standing for ‘gold’ and 魚 (gyo) for ‘fish’. But there is more to it than meets the eye. The characters are taken directly from Chinese, where 金 (jīn) correspondingly means ‘gold’ and 鱼 (yú) ‘fish’. Here 鱼 (yú) is also a homophone to 余 (yú) of ‘surplus’ or ‘in excess of’, making 金魚 also carry quite an auspicious significance. Kingyo come in a variety of colours of white, blue, red and shimmering gold. The latter two are most synonymous with goldfish and contribute to the perception of ‘summer colours’ or 夏色 (natsu iro) in Japan. Thus, when it comes to the summer related products here, kingyo is often chosen as the main adornment on anything from yukata to windchimes, uchiwa, traditional wallets and summer toys, to name a few. Kingyo. Photo by Chieko Uemura. Being a member of the carp family, kingyo is a close relative to koi (鯉), yet easily distinguished by the lack of whiskers or barbels. Over time kingyo have been bred to obtain different colours and colour combinations, body shapes, and features. Wakin (和金) is one of the most prevailing kingyo kind today, closely resembling koi in its shape and red-white colouring of scales. Despite the common misconception, kingyo or goldfish is an intelligent animal with excellent eyesight in perception of 100 million colours (one hundred times more than human) as well as learning skills that allow them to recall and distinguish between different people, and with active encouragement even master nifty tricks. With proper care goldfish is known to live for decades, which makes it for a great aquatic long-term companion for us. Raising a goldfish to its full potential requires a suitable environment that is often mistaken for a fishbowl. In reality, a fishbowl is the worst place one can attempt to keep a goldfish in. Goldfish requires lots of space to move around in, in a well-filtered, high oxygen enriched water habitat. The misconception of using fishbowls as adequate goldfish housing might have originated from China using fishbowls as temporary display vessels. Historically Chinese raised goldfish in ponds, and would only move them briefly into small fishbowls to be admired by their visitors and guests. Kingyo in the pond. Photo by Zamboni. Where did this golden creature come from? Goldfish first became domesticated and selectively bred into the kind that we know and love today around 10th century China. Prior to that goldfish was raised primarily for food purposes. It wasn’t introduced to Japan until 1603 in Edo era (江戸時代, Edo jidai, between 1603 and 1868). By the end of the Edo era kingyo was available to everyone and consequently lost it previously appointed status of wealth and sophistication. It was around this time, at the turn of the 19th century, when kingyo became the lead character in the game that would since become the highlight of the summer matsuri (祭, festival) culture in Japan. Goldfish scooping at Nezu Jinja Shikyousai. Photo by kisaxdots. Kingyo Sukui (金魚すくい or 金魚掬い) is a traditional goldfish scooping game that largely became associated with the summer matsuri stalls in the Taisho period (大正時代, Taishou jidai, between 1912 and 1926). Here the participants would try to fish out kingyo from a large water basin into a bowl with nothing but a rice paper scooper. However, this is easier said than done. The paper scooper breaks easily and the fish is often too quick to catch, requiring perfect timing for successful scooping. (These days you can also often find bouncy balls replacing the fish.) If you do succeed though, you get to take that goldfish home. To this day the game remains to be popular equally with adults as with kids. 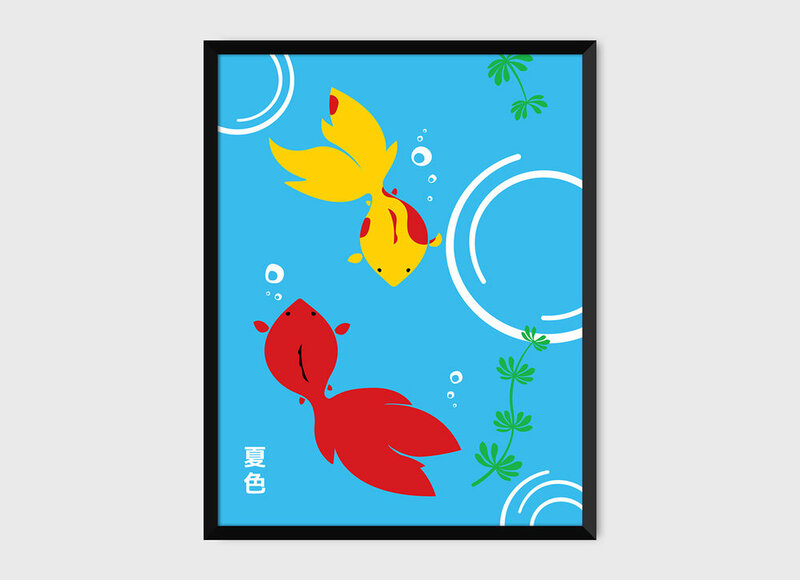 Our Kingyo print celebrates this long history of kingyo as this splashy symbol of summer in Japan. The colours featured are also known to be the ‘colours of the summer’ or as previously mentioned 夏色 (natsu iro), depicted in kanji characters at the lower left corner of the artwork. Together with the Windchime Watermelon and the Katori Buta Incense prints, it makes for a triple-print Japanese summer print collection that assures the spirit of summer will live in your home all year long. The New Year is just around the corner, and I honestly couldn’t wait for the day to come. Personally, I have always felt that New Year is the biggest, most important day of the year. Growing up in Russia it was definitely the most exciting day of the year. A somewhat of a Christmas and Thanksgiving fusion of lively winter holiday music, “New Year” tree adorned in ornate glass ornaments and string lights shimmering in the corner, Father Frost bearing gifts, a generous feast, endless supply of sparkling wine, and fireworks—New Year celebration is a party for the old and the young from sundown till daybreak. It is the grandest day of the year that is all about the family, and is celebrated traditionally as such. We have a saying: “The way you spend New Year’s Eve is the way you will spend the rest of the year”. And wouldn’t you agree that food, fun, laughter, and love are the most important ingredients for a wishful happy New Year. In Canada I feel that New Year celebration is always second place to Christmas. The atmosphere following the 25th would suddenly change. The cheer would fade. The decorations removed. The festive store shelves emptied. It just isn’t the same. New Year in Japan, however, is a whole different story. Similarly to the Russian spirit of New Year celebration, following Christmas the festivities to do not end there. They are just beginning. For New Year here is the biggest as well as the longest holiday of the year. It is once again all about the food, the family, and New Year fortune. And in truly Japanese way, it is also curiously unique. Oshogatsu (お正月) is the first month of the year, January, but most commonly associated with its first three days known as 三が日 (san-ga-nichi). These three days are spent visiting shrines, extended family members, and friends. The entire country takes a break from its busy life to enjoy and celebrate what really matters. The preparation for Oshogatsu (正月事始め, shogatsu-koto-hajime) begins early in December. There is a lot of work to be done, making it for most families the busiest month of the year. It starts off with cleaning. Not just any cleaning, the susuharai (煤払い) cleaning—similar to spring cleaning in the West, but in December. Literally meaning to brush off the soot, the practice dates back to the 17th century, when the common folk began to follow the custom first established at the Edo Castle in 1640 of cleaning ones household to purify and welcome the god of the New Year (年神, toshigami). Today many families will take the time to show their home some love in hopes of beckoning luck and prosperity on the New Year’s Day. Any celebration is not the same without the decorative tokens of the festivities. The same goes for Oshogatsu. As Christmas comes to a close, families will begin to take down the Western decor and replace it with 正月飾り (shogatsu-kazari, New Year’s decorations). The Oshogatsu custom comes from the early harvest thanksgiving and ancient religious practices; reflecting this are the festive decorations prevailing today. The main three are kadomatsu, shimenawa, and kagami mochi. Kadomatsu (門松), literally ‘gate pine’, is a pine and bamboo decoration placed at the entrance, usually in pairs, of one's home or shop. It can begin to be seen around by mid-December until January 7th, commonly featuring three bamboo shoots cut diagonally in different lengths, pine, and a base made of straw. The bamboo and pine are linked to the Shinto belief of god spirits residing in trees, and are symbolical as they represent longevity, strength, and prosperity. The different lengths of the bamboo denote the heaven, humanity, and earth from tallest to shortest respectively. Shimenawa (しめ縄) is a braided straw rope that can often be found in Shinto shrines to mark or enclose sacred areas as a talisman against evil. The Oshogatsu shimenawa or shimekazari (しめ飾り) is often braided resembling a wreath commonly adorned by daidai (橙, bitter orange), and placed at the entry, similarly to kadomatsu, to signify that one’s home has been purified and is ready to welcome the toshigami. In addition, the bitter orange in itself is a symbol of longevity as the fruit if not picked will remain on the tree for several years, which also can be linked to its homophone 代々 (daidai) meaning several generations. Kagami mochi. Photo by nolabwork. Kagami mochi (鏡餅), literally ‘mirror mochi (rice cake)’, is a two round mochi pyramid, believed to have originated in the shape resembling an old-fashioned round copper mirror, topped with daidai (bitter orange), and placed in various locations around the house. Each location in the house is believed to have a corresponding Shinto god, and thus one would place each kagami mochi at such locations: for kamado-gami (かまど神, god of stove) in the kitchen, nando-gami (納戸神, god of back room) in the bedroom, kawaya-gami (厠神, god of toilet) in the toilet room, and suijin (水神, water god) in the sink and bath facilities. The kagami mochi are easily found in supermarkets and are encased in plastic molding to prolong the rice cake lifespan. The kagami mochi are put out near the end of the year until January 11th, the Kagami Biraki (鏡開き, New Year’s rice cake cutting) Day. The cut mochi is then added into ozenzai (おぜんざい), a traditional red bean and mochi soup. In addition to the cleaning and decoration preparations, families are busy sending out written nengajo (年賀状, New Year’s post cards) adorned with the Chinese zodiac animal of the coming year. Similar to the Christmas cards in the West, the post office makes extra effort to deliver the nengajou by New Year’s Day. Some also partake in the old tradition of year-end gift giving, called oseibo (お歳暮). In December time supermarkets and departments stores around the country set up a special section near the entrance displaying exceptional sets of delicacies, such as confectionary, high grade marble beef, alcohol, and fruits. These are then sent out as oseibo gifts by the family. Traditionally these gifts are meant to say thank you to people who showed kindness to you this year. Today these gifts are more commonly sent to parents, relatives, and superiors at work. December 31st, New Year’s Eve, is the most important day. As the year comes to a close the sound of the temple bells will begin the fill the crisp winter air. The bells are rung 108 times (除夜の鐘, joyanokane)—107 on the 31st and one last one past the midnight of the New Year. The 108 chimes symbolize the human worldly desires, and is believed to expel the sins of the previous year. The celebration will thus begin and continue all through the night until the first sunrise of the year (初日の出, hatsuhinode). Hatsuhinode is believed to have spiritual powers, with many coming out at the break of dawn to wish upon the rising sun. It is also the day of shrine visits, hatsumode (初詣で, first shrine visit of New Year). Families first visit the shrine at midnight and then again on New Year’s day to pray for health, prosperity, and happiness in the new year, and pick up omamori (お守り, protection charms) on the way out. Because of this it is the busiest day for the shrines. Some young women will dress up in brightly coloured beautiful furisode, a traditional long sleeve kimono used for special occasions, making the shrine visit a treat for the eyes. Ikura. Photo by Adam Chamness. On New Year’s Eve to ring out the Old Year, soba is the dish of choice. The toshi-koshi soba (年越し蕎麦), literally year-crossing soba, symbolizes a wish for a long life, as long as the noodle. Soba is also an easy dish to make, allowing the housewives to rest after a long day of New Year preparations. On the morning of the New Year’s Day families will gather to eat the first meal of the year, a homemade osechi-ryori (お節料理). It is a specially prepared feast that was originally designed to wish for a rich harvest in the New Year. Osechi is served in special stacked boxes that resemble bento, called jubako (重箱). The boxed meals contain foods that are considered to be auspicious, with the ingredients prepared to last for days into the New Year. The osechi tradition first took roots in the Heian period (平安時代, Heian jidai, from 794 through 1185), when using a stove to cook a meal in the first three days was considered taboo. The osechi meals were thus made close to the end of the Old Year allowing the women to rest from cooking meals during the sanga nichi period (the first three days of the New Year). This tradition is still observed today, as many housewives prepare the osechi meals to be enjoyed in the days to come. The osechi contents may have changed over the years, but the practice strives to this day. In addition to the homemade osechi, many supermarkets and stores will have ample amount of ready-mades readily available for order. Osechi-ryori. Photo by Dave Nakayama. Just as the decoration pieces have their own symbolical meanings, each osechi ingredient is envisioned to bring luck as well. For instance, due to its curved back and long whiskers shrimp is thought to resemble an old person, and is thus believed to bring long life. The holes in the lotus root suggest ease of looking through to the year ahead. And cooked herring roe, kazunoko (数の子)—’kazu’ meaning number and ‘ko’ children—have the power to bless one with children. For more on the osechi dishes and their meanings, check out this article by Fae’s Twist & Tango. Otoshidama envelopes. Photo by Jnn. There might not be any presents under the tree for the kids, but there is otoshidama. Otoshidama (お年玉), literally New Year’s present, is a small gift given on the New Year’s Day to children. Similar to the Chinese New Year practice, children receive small envelopes (ポチ袋, pochibukuro) filled with money. The amount differs with age and family traditions, but commonly it is around ‎¥‎5,000 ($40~50). Leading up to the New Year, when parting at last it is common to say「よいおとしを」(yoi otoshi wo). Literally “Happy New Year”, it is a wish for the year-to-come to be a prosperous one. P.S. If you are reading this in 2017, 明けましておめでとうございます!! Our very own Christmas in Japan. It seems as if it has been forever since our last post with the “big” news. And despite being completely overwhelmed with boxes and unpacking these past few weeks, I felt Christmas is a good time to take that break and catch up on all that has been going on in our new world. Our place still looks likes a massive game of fort that has taken over our lives with the daily mission of finding the holy grail—that item you really need right now. But even in all this commotion and cardboard confusion, we did not forget the holiday cheer. Sure we were a little late in the setup, but against all odds we managed to carve out a spot in our home that is orderly and dressed in all its festive attire. Our tree and our entire collection of tree ornaments arrived without a scratch, which is a gift in itself, and have now become our little winter holiday oasis reminding us that even though the location is different, our family is together and the same as always. Decorations might have been delayed, but our Christmas came early this year as all our wishes came true. And with that we hope that this winter holiday season whatever it is that you wish for, and whether it fits under the tree or not, will come true for you as well! From our family to yours, Merry Christmas and Happy Holidays!!! Last year I wrote a post about the quirks of Christmas in Japan. When we’ve arrived here in Japan almost two months ago, the Christmas decoration and merchandising was already in full swing. The shops were playing the all-time Christmas classics. The shelves were stocked full of funny Santas, Christmas tree decor, … and wreaths! The last one was most surprising. Every department store, grocery shop, and outdoor flower stalls were filled with reasonably priced wreaths! Emphasis on the reasonably priced as I find most wreaths in Canada cost double of the asking price here. Last time we were shopping for Christmas decor in 2012 we found a decent holiday decor selection but nothing too creative. And I can’t seem to remember seeing any wreaths at all. This year was definitely a step up as I feel the wreaths and the toys can finally compete on the same level with the Christmas stock of mega malls back home. So why such a change? Perhaps it was finally brought on by the demand. People are decorating their places. Many doors in my neighbourhood alone are adorned with wreaths. Leaving me to imagine that the inside may be just as festive as the outside. We saw families stocking up on the decorations. Stores are even promoting their vast selections of full size Christmas trees to bring home. IKEA was actually in full swing on selling the real trees to their customers. Not sure what happens after though, as disposing of anything larger than a microwave box can be more than troublesome. But clearly against all odds in the short four year time, Christmas is finally beginning to become more of a family celebration here as well. Christmas is all around us… in Japan. Illumination is in full swing. It is the best part of treading the winter cold in Tokyo during the holidays. Anpanman is taking on the role of cosplaying as the Santa Claus and the public loves it! He is on Christmas cards, children’s Christmas books, and advent calendars. He is the real east meets west. Starbucks never ceases to amaze. And last but not least … almost white Christmas. Last month in November we have experienced the one and only snowfall for a day. What makes it even more special is that it hasn’t snowed here in November for over 50 years! Dare I say, I felt like a Gilmore Girl. We hope you enjoyed our little Christmas update. Merry Christmas! Happy unwrappings! Happy Holidays! Celebrating the moon, its beauty and all that it inspires! Make sure to step outside and marvel at the beauty that will dazzle our sky tonight! 満月(mangetsu, full moon) on 2016 月見 (Tsukimi). Photo taken in Oshawa, Ontario, Canada. The moon on Tsukimi 2016 was truly beautiful! The night was clear and the moon was especially bright. I managed to take this shot in Oshawa, Canada to share it with you. For the Love of Gaming + New PICA Prints! How nostalgic. I remember this as it was yesterday. Growing up in the early 90s, Russia had just been introduced to the video gaming that the world has already known for some time. At the time, the new Dendy gaming system was the one and only we knew and loved. I remember the brightly coloured cartridges that the boys in my class were fighting for to exchange. I always wanted to get my hands on one, but my dad argued that it would ‘break our TV’. Not sure if he ever really believed that; perhaps he was worried that with the system I would be indefinitely glued to the screen. Can't say the system was cheap either. Coming out right after the Russian separation from the USSR resulting in one of the biggest price inflations in history, 39,000 rubles was not a small price to pay. So, alas, I had to live out my video gaming vicariously through my friends. Dendy, the Russian Famicom clone. Photo by Nzeemin. At the time I did not know that Dendy was actually a clone of a system that took Asia, and shortly after North America, by storm almost a decade earlier. One great thing of growing up in the post-Soviet Union Russia in the 90s is that I got to experience first hand all the awesome things that the bubble Japan had to offer to the world in the 80s, a time when I would be simply too young to appreciate. Sailor Moon was imported shortly after, leaving a lasting impression of the magical Japan. This is when my love affair with Japanese language and things began to take root. This is when as a kid I've made up my mind that one day I will learn to speak Japanese just as my favourite characters on TV did. I was 9 at that time. So to commemorate my first nostalgic touch point with video gaming, I'd like to honour and pay respect to the very system that made the Dendy console I know growing up possible—Family Computer (ファミリーコンピュータ, Famirii Konpyuuta) or Famicom (ファミコン, Famikon). Famicom console released in 1983, Japan. Photo by Evan-Amos. The Famicom system came to life at the height of the video game crash of 1983, or as Japanese like to call it, Atari shock (アタリショック, Atari shokku). The crash came very close to devastating the entire North American gaming industry by bankrupting companies and sending it into a massive recession. This lasted for about two years, and in 1985 the industry began to recover mainly due to the widespread success of the newly introduced Nintendo’s NES. In 1983 Nintendo unveiled a brand new gaming system that not only featured brand new technology, but also innovative product design. Designed to resemble a toy, to reinforce the family aspect of the system, the Famicom sported a bright red-and-white colour scheme, two hard wired controllers stored visibly at each side of the unit, and an eject lever “just for fun”. The reaction to the new system was astounding. Within a year Nintendo ended up selling over two and a half million units. It was at this time that Japan proved to be a small market for Nintendo as it began toying with the idea of going abroad. They first approached Atari, the American video gaming authority since the early 70s, for a collaboration. Atari rejected it citing the recent video game crash resulting in an unstable video gaming market. This did not slow Nintendo down as the company decided to take matters into their own hands and introduce the NES (Nintendo Entertainment System) to the North American market. NES, Nintendo’s North American console. Photo by Evan-Amos. The NES system was meant to look different from its Famicom predecessor. The toy-like design was scrapped in favour of a more clean and futuristic boxy design and grey colour scheme analogous to the home entertainment systems of that time. While the controllers got a small design update, the major feature change was the replacement of the top-loading cartridge slot of the Famicom model with a front-loading chamber, placing the cartridge completely out of view. This was 1985, and the system sales proved to be tough. The video gaming crisis was still fresh on everyone's mind and few sellers were willing to take on the system. Nintendo found a way to turn things around by offering 90 days credit and accept returns on any unsold units. As a result, by 1986 the system was a North American hit and later world market success. Famicom games. Photo by Bryan Ochalla. So where is Dendy in all of this? While video gaming industry in the 80s and later in the early 90s were taking the world by storm, Russia has been completely overlooked. No one seemed to be interested in infiltrating the Russian scarce gaming market, until one company named Steepler changed things around. Using the technology, design and the cartridge format of the 1983 Famicom system, Taiwanese manufacturer created a “new” system that became known as Dendy and introduced it with much success to the Russian market in 1992. Regardless of whether it was a clone or the real deal, it was a well beloved system growing up, a true nod to the Nintendo’s technological genius almost a decade ago. Say hello to our new prints! To commemorate Nintendo’s contribution to the worldview of Japan and its culture in the 80s, we came up with two print sets, available in five colour composition choices, that are sure to make any true gamer nostalgic. This first set of prints features the notable Famicom controller. It was this controller that I remember most vividly as it inspired the controller of the Russian popular Dendy console system. The second set of prints is a nod to the Nintendo’s NES system—the system that forever changed the North American gaming industry in the 80s. I am sure these prints will bring up a lot of warm memories to anyone growing up in the West in the 1980 something. The controller prints feature our classic PICA Pop Art colour choice variations, plus a special edition of the classic Pop Art style print combo. Enjoy!